The government is currently deciding South Africa’s long-term electricity policy. It may be the most important thing it does this decade. Abundant electricity is a precondition for prosperity. If the latest Draft Integrated Resource Plan (IRP) is implemented, we will have state capture that dwarfs the worst we’ve had. We will perpetuate stagnation, unemployment and retarded transformation. We need brave, patriotic and wise politicians and officials to prevail over subversive interests. The draft proposes that we import what we do not have, render worthless what we do have, destroy the environmental, fleece the poor, suffer blackouts and maximise corruption. Citizens should become energy activists who write letters, make calls, attend meetings and lobby. This article provides intellectual ammunition for activism. Bad proposals rely on bad ideas, especially these myths. Myth 1. “Renewables” provide “lowest-cost” power. Countries most reliant on renewables have highest-cost power. Our draft relies on an illusion created by concealing the real cost of getting power procured from independent power producers (IPPs) to consumers, and of thousands of square kilometres of land diverted to solar and wind farms. The myth relies on implausible assumptions about foreign exchange rates, gas prices and electricity demand. Conversely, it exaggerates coal and nuclear power costs. “Levelised cost of electricity” mythology portrays renewables as cheap. There is no need for debate. We will know the real cost of electricity only if IPPs must provide constant “dispatchable” power. IPPs, not Eskom, should fill gaps by whatever means they recommend to Eskom. Eskom should buy power on a level playing field where all suppliers deliver constant power directly to the grid. Myth 2. “Renewables” are renewable. And green. People concerned about “climate change” and “resource depletion” have been conned. Electricity from the wind, water, sun and biomass are neither infinite nor green. Windmills, for instance, are like temporary skyscrapers built with toxic materials from resource-depleting mines, processed in coal-burning factories running on non-renewable power. They are transported in diesel ships and trucks for erection in pristine places or farms. When “decommissioned”, they go to toxic dumps. “Renewable” dumps will be so huge and toxic that greenies will demand a “balanced mix”, primarily clean coal and safe nuclear. Myth 3. Solar and wind farms are green. They occupy vast expanses of previously natural or agricultural land. Unsightly windmills produce climate change by impacting rainfall, birds, bats, insects, pollen, seeds, butterflies, moths, grasses, shrubs, subterranean life and the cooling/evaporation effect of wind. Windmills need maintenance roads, vehicles and workshops, and surface or underground cables, and powerlines and transformers for grid integration. They typically defile scenic areas. Since no comprehensive assessments have been done, so long-term implications are unknown. Myth 4. We should abandon what we have and import what we do not have. We have sufficient natural coal and nuclear reserves for centuries. The idea is to abandon these in favour of imported gas and machines. Myth 5. Wind and solar can provide constant power. Consumers need constant power; Eskom must buy erratic power when the sun shines and the wind blows. Under insane procurement deals imposed on Eskom, IPPs deliver power that surges and crashes wildly. 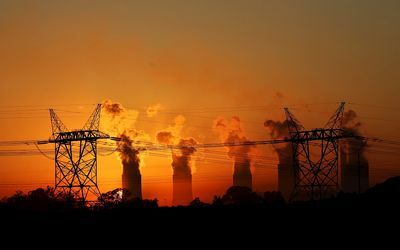 Eskom must fill gaps between spikes and valleys by ramping gas and diesel burning up and down, by buying extremely costly and toxic batteries, and by building water pump dams. It is like being told to buy a car you must use whenever it runs at unpredictable speeds. You must provide “backup” or “baseload” transport (bicycles, busses or boots) when it is slow or stationary. And leap in whenever it moves. Myth 6. Renewables “create” jobs. Jobs are not “created”. Investment relocates jobs. Anyway, more jobs producing less power is bad; progress involves more is done by fewer people. Energy Minister Jeff Radebe was misinformed when he was told “job years” are jobs, and that renewable deals will “create” 114,000 job years. “Job years” are a way to lie about job creation. Job years are all the time worked by all workers throughout the life of an enterprise. By that logic, a 200-year hydro-power dam with ten employees creates more employment (2000jy) than a 20 year windfarm with 50 employees (1000jy). Creating jobs is easy. They can produce pedal-power with thousands of workers peddling exercisers with generators. What matters is real productive jobs. Myth 7. We need little power because there is “falling demand”. The world over, power correlates with prosperity; no power, no prosperity. The daft IRP’s pessimistic vision is perpetual stagnation, poverty and unemployment. The falling demand myth relies on a once-off anomaly caused by the 2008 blackout crisis followed by 350% increased prices. Everyone, from shack dwellers to industrialists, was forced to cut consumption and invest in private “off-grid” power. If we want prosperity, we must have huge coal and nuclear power investments, supplemented by renewables at competitive prices on a level playing field. Why does the government take irrational proposals seriously? It may be the victim of a new kind of “Guptas out, IPPs in” state capture. IPPs spend fortunes on propaganda. We do not face a binary choice between renewables and coal/nuclear. The Daft IRP is a 180 degree reversal of the preceding IRP. The lesson to be learned is that the future is unknowable, that what’s needed is humility, to which end the government should replace the biased proposal with a balanced role for all options.